At the Culinary Classroom, we want to teach you how to treat your tummy well. But we are also dedicated to giving back to our community outside the kitchen – that’s where our partnership with CoachArt comes in. CoachArt is a fantastic organization whose mission is to provide chronically ill kids and their siblings scholarships, specialized lessons, club memberships and opportunities to participate in fun activities at no cost to their families. We have partnered with CoachArt for several years and always look forward to the opportunity to work with some truly amazing kids through our cooking classes. Want a taste of this cool collaboration? 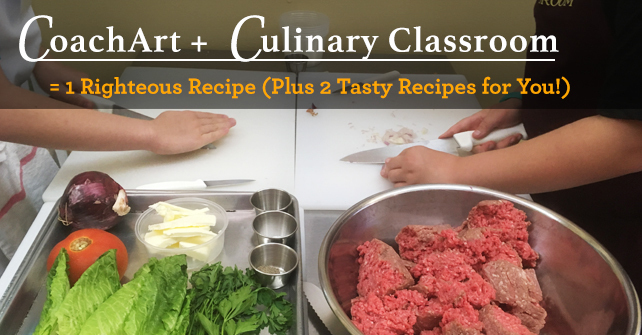 Check out a couple of the recipes that we teach our CoachArt kids. All this talk of scrumptious delicacies will get your mouth watering. It’s not too late to send your kids to the Culinary Classroom’s Summer Camp! Sign up here. Place the ground beef in a bowl. Add Chef Eric’s Sizzle Blend, garlic, shallots and parsley. Season with one teaspoon of salt and a half teaspoon of pepper. Gently mix the ingredients together. Do not over mix! Divide the mixture into 12 equal sized pieces and shape them into patties. (They should be 2.6 oz each) Refrigerate until ready to cook. Transfer the finished burgers to a pan and cover loosely with foil. 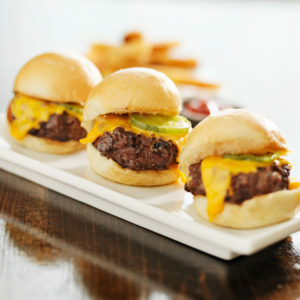 Set the burgers on the roll bottoms and top with the pickle slices. Add the roll tops and serve. In a small bowl, combine the Chef Eric’s Smooth Spice Blend, olive oil, wine, salt and pepper. Stir to blend. If using wooden skewers, be sure to soak them in water for about 30 minutes while you cut the vegetables. Once the skewers are assembled, arrange them in a single layer in a baking dish and baste them with a little marinade. If using a charcoal grill, light the coals and when they are covered with white ash, spread the coals out and set a grill rack about 4 to 5 inches from the fire. 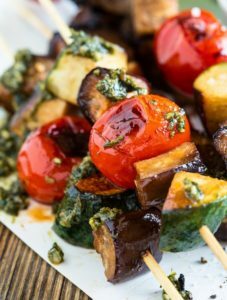 Over medium-high heat, grill the skewers for about 5 minutes per side, or until they are tender and lightly charred. Baste with the marinade a few times while cooking. Serve room temperature with Basil Pesto Sauce. Wash and dry the basil and mint leaves. Make sure that they are well dried. Put all the ingredients except the oil into a processor. Puree the ingredients until a paste forms. Be sure to scrape down the sides of the processor bowl with a spatula as you work. With the machine running, slowly add the olive oil. Season to taste. Store in a container with a tight fitting cover. Will keep in the refrigerator for about two weeks. The biggest change for me is having more confidence in the kitchen – which leads to trying things (with a higher success rate!) and having the courage to “whip something up” on short notice. I just want to thank you for a great cooking class on knife skills last Saturday. I have already begun practicing, as I prepared my vegetables for the week. (See attached photo) 🙂 I can hardly wait to do more. Thank you again for a wonderful first cooking class!